for $579,000 with 3 bedrooms and 2 full baths. This 1,405 square foot condo was built in 2001. One or more photo(s) has been virtually stagedGorgeous Panoramic Sarasota Bay & Downtown City Views transition from spectacular sunlit views to shimmering twilight vistas in your private urban oasis. This luxury condo is a light and bright end unit featuring on trend great room design overlooking beautiful bay view and open air balcony. Kitchen with breakfast bar open to the great room for today's casual lifestyle. Desirable split bedroom and bath design is ideal for family or guests. Accentuated with crown molding, cased windows, newer carpet and paint, solid surface and granite counter tops and newer stainless steel appliances in the kitchen. Residence includes under building parking and canopy parking, storage and guest parking. World class amenities include 24/7 reception, outdoor heated pool, spa & grilling area, state of the art fitness center, club room with kitchen, media room, conference room and business center. 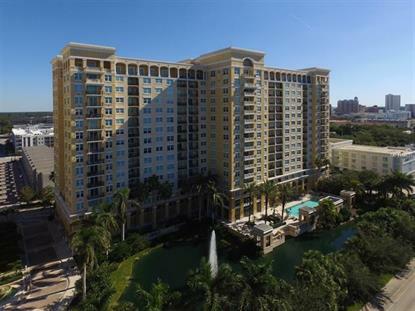 Secured entry and pet friendly, the best of city living is yours, located in the desirable Rosemary district with accessibility to Sarasota's bay front, diverse cuisine and cultural venues including theater, art, galleries, symphony, opera and ballet. You are a quick drive to St. Armands Circle boutique shopping and dining and the glistening gulf waters of Lido Key Beach. "The Bay Sarasota" a proposed redevelopment of 50 city owned acres of bay front across from the Renaissance is planned for expanded public open space, a new performing arts facility, park and play area, waterfront boardwalk, piers and dining.